However, thanks to the smashing success of The Lonely Island, the comedy group comprising Adam Samberg, Jorma Taccone (who co-wrote and starred) and Akiva Schaffer (who co-write, directed and had a cameo), Hot Rod has become a cult classic. You really have to be in the right mood and ‘get’ the humour to enjoy Hot Rod. The whole film is freakishly random, makes no sense, and has an extremely low IQ, but that’s what makes it such a classic. It makes you wonder if the film is intentionally awful (I think it is). Of course, the entire affair is bit hit and miss, and there is a good chance many of the jokes will fly straight over your head during the first viewing. But Hot Rod is the type of movie that can withstand repeated viewings. In fact, it is the type of movie that gets better with repeated viewings (some would say it can’t get worse). Of course, there is the over-the-top slapstick stuff, which can be pretty funny – but it’s the WTF random moments (of which there are plenty) that take Hot Rod to a plane of its own. There are many bizarre sequences, such as the Footloose tribute, ‘cool beans’, and my personal favourite, the AM radio tattoo. I don’t like to give away too much, but this movie is old, so I’ll give a bit of extra background. Adam Samberg plays Rod Kimble, who is out to raise money by performing stunts in order to save his ailing stepfather – so he can ‘smash his face in’ and gain respect. Jorma Taccone plays his step-brother (who may be semi-retarded), and Mrs Borat/Ali G/Bruno Isla Fisher is Denise, his cute neighbour. Other cast members include Will Arnett (GOB from Arrested Development), Danny McBride, Ian McShane, Bill Hader and Sissy Spacek. Hot Rod is a not great film by any stretch of the imagination, but it had moments that made me laugh hard. 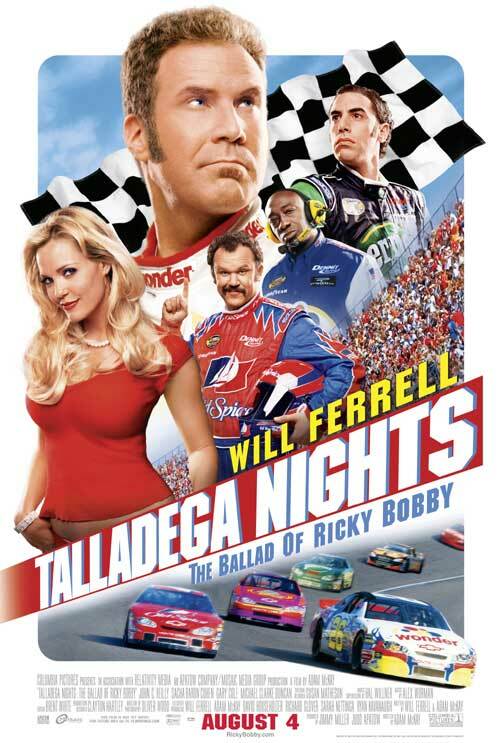 And it’s certainly better than Talladega Nights.